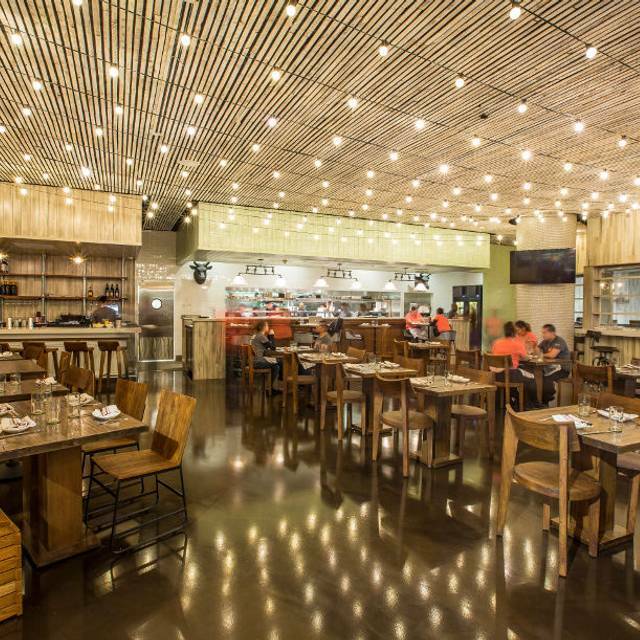 Situated inside Latinicity, Pueblo is a homage to everyday Mexican home cooking. With a vibrant and casual space, Pueblo invites you to experience the dishes and flavors acclaimed Chef Pablo Salas was fortunate to enjoy growing up in Toluca, Mexican - with a contemporary twist. Please note your reservation is for Pueblo, not Latinicity. Our server, Ben, was attentive and made great suggestions from the menu. The food was delicious. We both had the grilled mahi mahi and enjoyed it very much. Great atmosphere, prompt service and love the space's design. I will definitely dine there again. Can't wait to try other selections. This is a perfect setting for people/families, that want to catch a better than average meal quickly. The servers were very attentive. The food was okay. It was noisy. The modern acrylic chairs have the restaurant a hip look, though once they’ve been used for awhile scratches etc. will detract from their appearance. I would probably not return to eat here. Couldn't get a 5:30 reservation so settled for 5:45. Got there at 5:15 and there were no other diners for at least twenty minutes. Everything was ok and as stated in the small menu. They didn't offer any happy hour specials to us; however, the women who sat next to us asked and they gave them a special menu. That should have been given when we arrived. The location next door has a much better vibe and we will return there on our next visit. So disappointed with Pueblo. We chose to eat there before a show at the theatre across the street. We figured we would be able to enjoy a relaxing Mexican meal and not feel rushed because of the restaurant's proximity to the theatre. We were seated at 6:20. Our waitress did not come to our table until 6:40, at which point I mentioned two of the three of us needed to be finished before the 7:30 show began. She gave me a concerned look as if there was not enough time to do so. We placed our order then and there. The food did not come to the table until 7:20, at which point the two that were seeing the show left, without eating. I ate by myself and took the other two meals home. Spent almost ninety dollars on a meal that wasn't relaxing at all. I think there was only one waitress working for about 13 tables. Drinks were not refilled at all and basics like napkins and silverware had to be asked for. Will not be returning anytime soon. The service was very good, showed teamwork among the staff. We were going to the theater and they got us fed and out quickly. The salad of mango and jicama was exceptional, very tasty! We loved it. The entrees were good-the flank steak and the fried pork carnitas. The mole was average-lacking pep and taste, but the rest of the entree was very good. The ambiance leaves a little to be desired but all in all, a good experience. I would go back. We had dinner at Pueblo last night. We had an early reservation (pre-theater) at 6pm. There was one other table occupied in the restaurant. We were seated and then it took more than 15 minutes for someone to come over. Since we didn’t know how long the food would take, we ordered all at once specifying the apps we wanted to start with. Our apps dinner and drinks all arrived at the same time....disappointing! The food was delicious, but the service just took away from the experience. Place is empty. Napkins are paper towels. Food was less than good. Not worth going again. Our meal started with them telling us they ran out of beer and Chardonnay last night because of a party. Our reservations were at 6pm - more than enough time to stock back up before dinner. The restaurant itself it located next to a food court and you can see the food court right next door. Not romantic. The waiter was bizarre in telling me that I shouldn’t order the chicken dish because it would take 17 minutes to cook. Food itself was okay - no complaints there. Not a robust kids menu - choice of quesadilla or quesadilla. Don’t think this restaurant will last. This is restaurant is situated in the middle of Latincity. While the food and drink were good, the atmosphere is a little awkward around happy hour since there are open windows to Latincity which is hopping during Happy Hour. The website is a little misleading and the happy hour deals are not available in the restaurant. We went before a theatre show and barely made it out in time for the show. If I went again - I'd go for Happy Hour at Latincity and skip the restaurant, there is not anything special or noteworthy about it. Understaffed, so service was clumsy & slow (albeit ver friendly). Could be a nice place if they could work out those kinks. So much went wrong tonight that I'm not sure where to start or end this review. The overall theme is the staff needs training...or perhaps just firing and start over. The two girls at the front desk were both rude and incompetent. The waiter hadn't tried most of the dishes, replied "I don't really like any of it" when asked for his recommendations, and also forgot to put in our order. It took almost 30 minutes to get chips and guac. Then at the end, the bill was wrong and the checkout people were confused. I'm truly astounded this place hasn't folded yet. I guess I should have known given that there were almost no customers in there on a Saturday night. Where to begin.... we didn't even get to eat. Didn't even to get to order a drink. Went there on a Saturday night before a show. The waiter never even came to our table. Looked at us and continued to ignore us. Went to the table in front of us several times to check on them and take orders. Then when I went to confront the waiter with the blonde man bun and he said, "Whatever and shrugged his shoulders". Absolutely terrible. I would never recommend this place to anyone and I would avoid it all costs. Pueblo has fantastic, authentic Mexican cuisine. Eveything was delicious! My friend, who grew up in Mexico, said each dish was just as she remembered it from her childhood. Will definitely go back when I visit Chicago again. Very good food. Deserves to be much more crowded than it was. Mango and jicama salad was excellent. Happy hour specials were limited but delicious. We were dining with another couple before seeing Dr. Neil DeGrasse Tyson. I made reservations at Pueblo as it was convenient and assumed it would not be a long dinner. We informed them when we arrived that we were going to a show. It took a long time before anyone came to our table. We flagged down a young man who apparently was a bus boy. He said he would get someone. When a server did not come, he came and attempted to take our order. Some time passed and a server came to figure out our drinks. Apparently, the margaritas are just poor quality out of the tap. We again emphasized that now we really were in a hurry. We waited and waited for the food. The food was definitely disappointing Mexican fare. We were sorry that we had not left and got food from the other options. I expected better from Latinicity. The restaurant was not even busy. Now I know why. We will not be returning. Margaritas are way too sugary but dinners were very good and price friendly for the Loop. Presentation and taste were delightful. Table service was poor. For example, serving main course while pushing dirty/empty appetizer plates around on-the-table, leaving expired drink glasses on-the-table when fresh drinks were served, and not refilling or offering to refill empty water glasses. Go for the food, not for the service! Great service and interesting Mexican food. Had a very enjoyable meal, however they do not participate in Opentable and did not have reservation. Fortunately there were open tables. Use their web site. Nice quiet atmosphere. The food was delicious and reasonably priced. It was perfect for our pre-theater meal. I look forward to going again and again! We were visiting Chicago from out of town and Pueblo was close to the show we were seeing a few blocks away. Online it looked like a nice little Mexican Care with an interesting menu and pretty good prices. What was great was the very attentive service (admittedly we were VERY early at 530) but what was disappointing was the ambience. Pueblo is in a 3rd floor cluster restaurants offering (very) casual dining that is more of a food court vibe than a restaurant. And no windows, just a small restaurant with an average menu that is better than a chain TexMex joint. This is the restaurant in Latinicity. We selected it because we wanted table service, and wanted to try out the food. When we arrived, we were told we could sit anywhere - the place was empty, so that was not an issue. The only other parties there while we were there was a business group of 10-12 diners, and a family with an infant. We ordered a starter and entrées. The "starter" came after the entrees were served - I was beginning to think the server had not placed the order. The grilled flank steak was disappointingly tough. My friend enjoyed the fried Mahi Mahi. The rajas con crema was quite good, however, it was served after the entrees, not as a starter, so we did not have time to enjoy it. Quiet, not crowded. I was very disappointed in Pueblo. The pork in my carnitas was tough and came in clumps. The salsa was too sweet. The service was also very poor. The food was excellent. The service was not so good, but we were the last table before closing time. No excuse for bad service, but would still recommend highly. Puebla did not have my reservation when I arrived and notified me that the restaurant does not use Open Table for accepting reservations. The hostess was kind enough to find us a table on a very busy Saturday night. Wow! What an awesome surprise at lunch. This place is amazing. We has apps, lunch and tres leches for dessert, and this chef did not disappoint us! Everything was fantastic! Like a tiny sliver of heaven on a plate. Margaritas were great too! I’ll be back! Kudos to the chef and amazing staff! The flavors were fabulous. We will definitely be back. The food at this restaurant is much more sophisticated than the ambiance. While there are waiters and waitresses who are very attentive, the tables are not set with silverware and the napkins are not much different from paper towels. That being said, everything we ate was fresh, well seasoned, and balanced in flavor. The impression I have is that the food is prepared by a skilled chef, but the atmosphere is designed to feel like a neighborhood restaurant in a not very affluent neighborhood. Overall decent mexican food. I would recommend improving diversity of cocktails offered, and just include a standard classic margarita in addition to others offered. Entree options seemed a little limited as well. Great food in an excellent setting. quiet setting in the middle of a food court. Was a night out with my best friend. Taking in a show and dinner downtown.